And a Happy Easter was had by all! 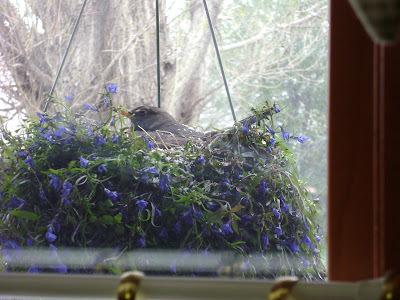 That's a robin that laid some eggs in my plant which will now die because I cannot in good conscience let myself pour water on that nest. The plant is toast. If you look closely - you can see snow on the mama bird's back. 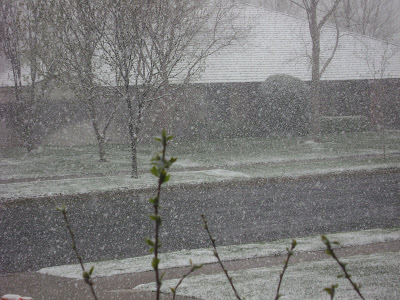 However, it warmed up to 30 degrees today, which enabled the kids to have some Easter Fun. This means the Great Confetti Egg Fight was a huge success. I had 6 dozen confetti eggs. They lasted all of 5 minutes. Check it out!! 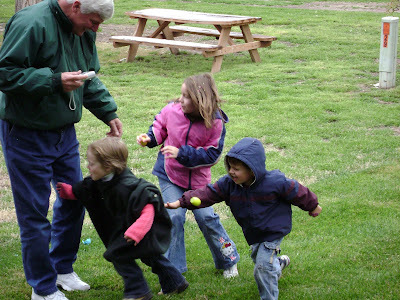 Ethan just let that yellow egg fly at his cousin Peyton, and Ashton had just nailed her grandfather and was about to pay the Piper. 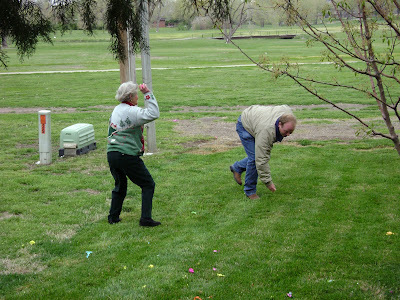 But...just to show how fun the confetti egg fight was...the grownups started diving in to the egg cache, and this would be one of my favorite pictures of the day. Happy Easter guys! From me to you! Y'all grow some mean grannys there in Texas! Great pix, Norman! Happy Easter. Too funny! What the heck are confetti eggs though? Not that I would have used any yesterday since we had to stay inside because of the rain, but might need some for next year. Confetti eggs? Do you buy them or make them yourself? And you encourage your kids to peg anyone and everyone with them? Tsk, tsk. Linda - THANKS! And yes...those Grannys are actually really mean. i surprised them and myself by actually participating in their Easter this year...long story..
Lisa - You've never heard of confetti eggs?!! I didn't know that it was a southern thing!! I just thought everyone knew about them! Confetti eggs are real egg shells, with the very top cut off and the whites & yolks dumped out. Once they're emptied, you can dye them or paint them whichever color you want, then let them dry. Fill them with confetti, and glue a small square of tissue (preferably matching the dye or otherwise decorative looking). Then you smash them on top of your friend's head. It's awesome. Freak - Did I make them? Heck no!! We bought them at CVS. They were a bargain!! 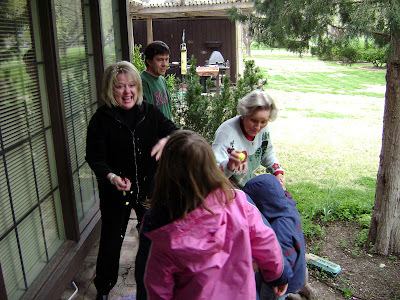 This is the second year that we had the confetti egg fight, and I'm afraid it's now a tradition. 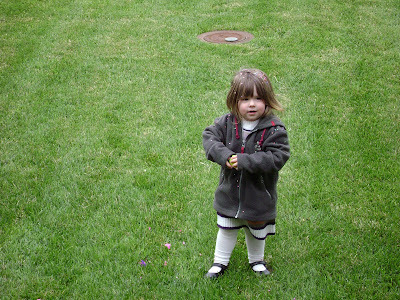 The kids talked about nothing else except the confetti egg fight. Last year I got 3 dozen. This year I got 6 dozen. I think next year...I'd better get 9 dozen. The kids absolutely adore it, and as you can tell - the "grown ups" were having a time with it as well!! Hope all of ya'll had a Hoppy Easter! Buy them? But you could make them yourself for so much cheaper. Confetti eggs sound so cool!! !